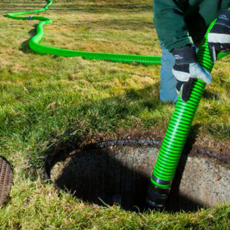 Snyder’s Environmental Service offers a full array of services to assist business owners with their sewer and drainage needs. SES offers Commercial Vacuum Truck, Grease Trap, Drain Cleaning and Hydro-Jetting services for its customers. If a business owner suspects an issue with their systems, our technicians can identify the problem and recommend repair options onsite. Check out our list of service areas and call us at 812-579-5974 to schedule your inspection. We look forward to serving you. SES can take care of your vacuum truck needs for non-hazardous liquids. 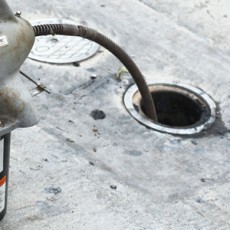 SES can handle any size grease trap that you may have, from the larger outside tank to the smaller inside tank under the counter. Please call us at 812-579-5974 for professional cleaning and proper disposal of your kitchen grease trap waste. We have a variety of cable machine sizes to open any line blockage that you may have. We use the highest quality Spartan Cable Machines with the best cable in the industry. 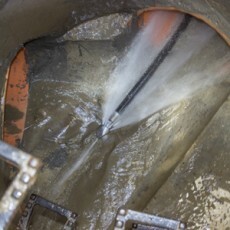 Sometimes Hydro-jetting is required to clean pipe blockages that the cable machine cannot open. High pressure water can scour the inside walls of the pipe, removing build-up and debris. Call 812-579-5974 to immediately dispatch an expert. Spartan 798 Jetter: can clean up to 24 in. pipe at 500 ft.
General J 2900 Jetter: for cleaning up to 8 in. pipe at 250 ft.
General J 1500Electric Jetter: for cleaning up to 150 ft. The pipe camera is a great tool to look into the pipe for breaks, collapsing or root intrusion. Without this tool, you can only guess at the cause of the problem. With footage markers and signal location, we can pinpoint the problem area.